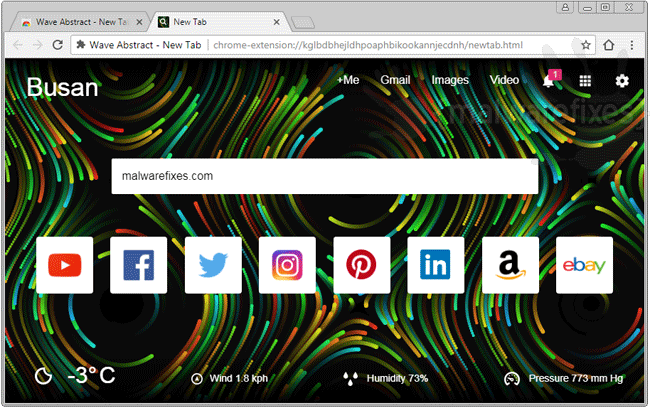 If home page of Google Chrome is taken over by Wave Abstract – New Tab, then it is possible that the same extension is controlling the browser. Official site states that this program can add some vibes to your new tab and homepage by displaying wavy animation effect. In addition, Wave Abstract is offering other features like quick access to favorite web sites and free weather updates. Some people find this extension useful due to this attractive element. However, some computer users find Wave Abstract disturbing. Actually, it is invasive to the point that it will never seek permission from user prior to installation. Freeware like games, tools, download manager, media players are just some transporter of Wave Abstract. It arrives on the computer as part of software bundles. Upon execution of the free program, adware and other unwanted application that are part of the package are loaded onto the computer if user opts for automatic installation. Thus, it is vital to run this process in “Custom” mode to exclude programs that are not appropriate. If in case Wave Abstract – New Tab is installed, it will alter Google Chrome settings right away. Search.wave-abstract.com is set as the new homepage, new tab, and search engine. Reversing the settings is difficult at this moment due to browser helper objects that loads Wave Abstract configuration each time the browser starts. Therefore, it is vital to get rid of this adware in order to bring back the preferred homepage and search provider. Below is our simple guide to help you remove Wave Abstract along with other malicious objects that arrives with it. Execute the procedures in proper way to ensure the complete removal of adware from the computer and Google Chrome browser as well. 3. Look for and remove Wave Abstract entry. If not present, look for any suspicious labels that was installed recently. 4. It searches for presence of harmful programs, plug-ins, add-ons, or any data that were found malicious and linked to Wave Abstract. You need to Clean all items detected by this tool. After the previous scans, you may have deleted Wave Abstract from the affected browser. This next step will ensure that no more module of adware will be left on the browser. This free tool scans and checks the browser for unwanted add-on and extension, and if found, Avast Browser Cleanup will give you a report and suggestion. 4. Avast Browser Cleanup will confirm before it permanently deletes the add-on. Please click Yes to proceed with the removal of Wave Abstract on the affected browser. 3. 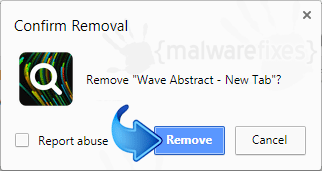 On Extensions window, please delete Wave Abstract by clicking on Remove or Trash icon. 4. Google Chrome will prompt for the confirmation of Wave Abstract removal. Please click on Remove button to proceed. Resetting Google Chrome to default settings is helpful in deleting hard-to-remove extension such as from Wave Abstract. This method is highly advisable to perform if you have difficulty in removing unwanted extension. This function will reset your home page, new tab page, search engine, and other areas affected by Wave Abstract. Unwanted extensions will also be removed from the browser. This will not affect your bookmarks, history, and other saved data. You may also run Chrome Cleanup function from this page. An integrated tool from Google Chrome but with more advanced Adware scanner feature.